Family Friday; Four Abberton Daughters, Bridget, Mary Ann, Margaret Josephine and Honorah. I don't have much on these four Abberton daughters, so thought that one post would be enough. 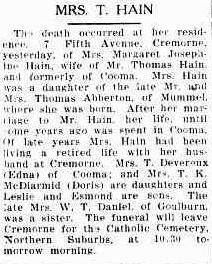 What I have has been gleaned from TROVE, NSW Birth, Death and Marriage records and other family members. Bridget, Mary Ann, Margaret Josephine and Honorah are big sisters to my Thomas, the next child. Of these Mary Ann is a twin but sadly her twin sister died aged three days. I can find no record for her. Bridget was born in 1856, being Thomas and Mary's third child and second daughter. In 1881 she married James John Ferney (b 1858 d 1917). They had one son, Thomas Abberton Ferney, born 1882, d 1960, m 1904 to Amy Maria Hill (d1954). They in turn had two sons, Leopold b 1905 d 1956, m Marie Potts. And John James b 1910 d 1961 m 1942, Olga Hillway. Francis T J b 1901. This is the total of what I have on Mary Ann and her family. Ida T b 1890, m 1924 John C Crisp. Edna L b 1893, m 1920 Timothy Deveraux. They had two children, a boy and girl. Esmond S b 1900, m Alice M Gammell. Doris M b 1903, m Thomas McDiarmind. They had two boys. From my research I think that Margaret might have been a teacher, before her marriage. Something that I'm going to look into. Francis A b 1887, d 1952. Cecil Wilbert b 1890, d 1958. Elma May b 1891, d 29 June 1971, (Mrs Hermes). Vera Clair b 1892, d 1970. Norrie Catherine b 1896, d 1961. Albert Vivian b 1897, d 1961. Not much to show for four lives but I hope that through, this blog, I might make contact with 'cousins', I hope so. Next week I'll introduce you to my Grandfather, Thomas and his twin sister, Frances.